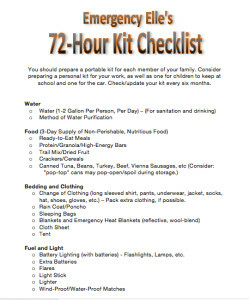 Download Emergency Elle’s 72-Hour Kit Checklist! Emergency Elle discovered the secret to where Super Powers lie, in the face of natural disasters! … (Are you saying, “Super Powers, what? !” Watch the video!) Prepare your 72-hour kit TODAY! Don’t delay – because a natural disaster may be lurking about! Click here, on the checklist below, or any orange words on this page, for a PDF copy of this comprehensive 72-hour kit checklist! Get going … and have fun building your very own SUPER POWERS! TIP #3: The best place, with the best prices, to purchase items on your checklist is Emergency Essentials! Emergency Elle said so! And if she said so, then it must be good! Check them out!